Mulla Nasrudin was walking along the village street with a friend when some rambunctious children surrounded him and teased him for the patches on his clothes and the worn shoes he sported. "Stop bothering me," Nasrudin said, "and I will tell you something very interesting." "Okay," said one of the boys. "but no philosophy!" "Of course," said Nasrudin. "I can see that you are already skilled at discerning Truth. Well, it seems that the Emir is giving a banquet that is free to all who come." The children yipped with joy and anticipation and ran off in the direction of the Emir's palace. Nasrudin and his friend laughed as the children disappeared in the distance. "Very clever," said Nasrudin's friend. "I almost believed you myself." 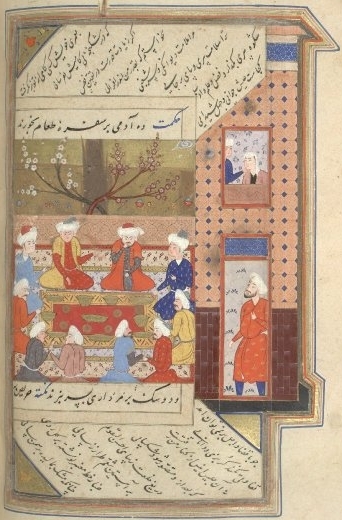 Nasrudin imagined what such a banquet would look like if it were truly happening: sumptuous fruit, refreshing drink, seasoned dishes of all kinds. He licked his lips. Somebody bumped into Nasrudin and he saw several children running along the street. "Where are you running to, so quickly?" asked Nasrudin. "Haven't you heard? Someone said the Emir is giving a free banquet!" "Really," said Nasrudin. He gathered up his robes and began to run after the children. "But Nasrudin," said the friend, "you're the one who made that up." "I know," said Nasrudin as he ran quicker still. "But maybe it's true after all!"